One nice aspect of the symbiotic relationship between Final Cut Pro X and Motion is that Motion can be used to create effects, transitions, titles and generators for use in FCP X. These are Motion Templates and they form the basis for the creation of nearly all third-party effects filters, both paid and free. This means that if you learn a bit about Motion, you can create your own custom effects or make modifications to the existing ones supplied with FCP X. This has become very easy to do in the newest versions (FCP X 10.2.1 and Motion 5.2.1). I decided to build a color correction filter that covered most of the standard adjustments you need with the usual types of footage. There are certainly a number of really good color correction/grading filters already on the market for FCP X. Apple’s own color board works well and with 10.2 has been broken out as a normal effects filter. However, a lot of folks don’t like its tab/puck/swatch interface and would still rather work with sliders or color wheels. So as an experiment, I built my own color correction filter for use with FCP X – and you may download here and use it for free as well. Let me point out that I am no Motion power user. I have nowhere near the skills of Mark Spencer, Simon Ubsdell or Alex Gollner when it comes to using Motion to its fullest. So all I’ve done is combine existing Motion filters into a single combined filter with zero modifications. But that’s the whole point and why this function has so much potential. A couple of these individual filters already exist singly within FCP X, but Motion has a lot more to choose from. Once you launch Motion, the starting point is to open a new Final Cut Effects project from the Motion project browser. This will default to a blank composition ready to have things added to it. Since I was creating a color correction filter, all I needed to do was select the existing Motion filters to use from the Library browser and drag-and-drop the choices into the composition. I decided to combine Brightness, Contrast, Color Balance, Hue/Saturation and Tint, which were also stacked in that exact order. The next step in the process was to determine the state of the filter when you apply it and which parameters and sliders to publish. 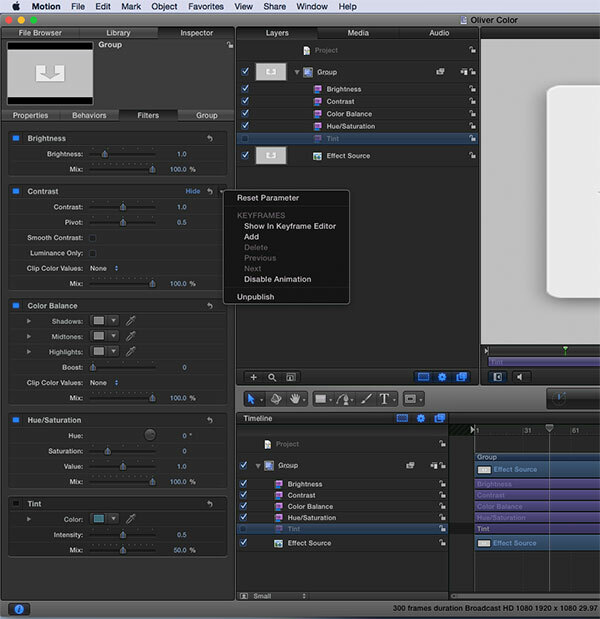 Items that are published, such as a slider, will show up in the inspector in FCP X and can be adjusted by the editor. In my case, I decided to publish every parameter in the stack. To publish, simply click on the right side edge of each parameter line and you’ll find a pulldown selection that includes a publish/unpublish toggle. Note that the order in which you click the publish commands will determine the order of how these commands are stacked when they show up inside FCP X. To make the most sense, I followed a straight sequence order, top to bottom. You can also determine the starting state when you first apply or preview the effect. For example, whether a button starts out enabled or disabled. In the case of this filter, I’ve enabled everything and left it at a neutral or default value, with the exception of Tint. This starts in the ‘off’ position, because I didn’t want a color cast to be applied when you first add the filter to a clip. Once everything is set-up, you simply save the effect to a desired location in the Motion Templates folder. You can subsequently open the Motion project from there to modify the effect. When it’s saved again, the changes are updated to the filter in FCP X. If you’ve downloaded my effects filter, unzip the file and follow the Read Me document. 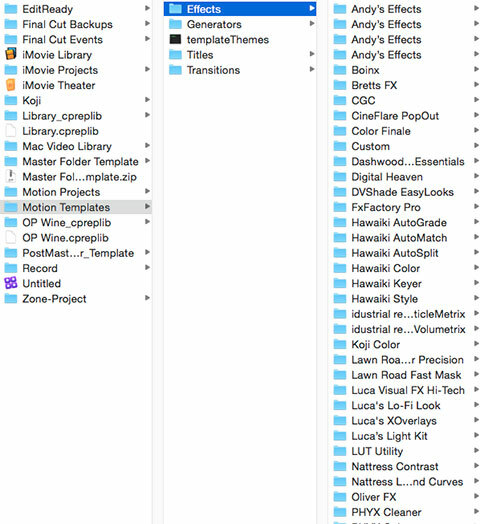 I’ve created an “Oliver FX” category and this complete folder should be placed into the User/Movies/Motion Templates/Effects folder on your hard drive. Applying the filter inside Final Cut Pro X is the same as any of the other effects options. It has the added benefit that all parameters can be keyframed. The Color Balance portion works like a 3-way color corrector, except that it uses the OS color picker wheels in lieu of a true 3-color-wheel interface. As a combination of native filters, performance is good without taxing the machine. UPDATE (12 June 2015) : I have added one addition filter into the download file. The second filter is called “Oliver DVE” and designed to give you a full set of transform controls that include XYZ rotation. It comes from the transform control set included with Motion. This provides you with the equivalent of a 2.5D DVE, which is not available in the default control set of FCP X.
UPDATE 2 (15 June 2015) : These filters are not backward compatible. They will work in FCP X 10.1.2 and Motion 5.1.2 and forward (hopefully), but not in earlier versions. That’s due to technology changes between these versions. If you downloaded these prior to June 15, for FCP X 10.1.2 or 10.1.4 and they aren’t working, please download again. I have modified the files to work in FCP X 10.1.2 and later. Thank you. Download the free “Oliver Color” and “Oliver DVE” filters here. My previously-created, free FCP X color board presets may be found here. This entry was posted in apps-gear-filters, color grading, Final Cut Pro X, My Projects, tips and tricks and tagged color grading, editing, FCP-X, plug-ins.